There is one thing that I absolutely love to indulge in, Belgian Waffles! Why couldn’t I make a healthier version that tastes amazing and was made with real, wholesome, healthy ingredients? I couldn’t think of any reason why not, so I set out to make these delicious Belgian Waffles. So what is a Belgian Waffle? According to Wikipedia, The Belgian waffle is a type of waffle identified by its larger size, lighter batter and higher grid pattern which forms deep pockets and has larger squares than other types. In Belgium, there are a number of different types of waffle, including the Brussels waffle, the Liège waffle and the stroopwafel; what is known in North America as the “Belgian waffle” is most similar to the Brussels waffle. As opposed to a traditional waffle, the Belgian waffle attributes its height to the use of yeast batter instead of a pancake batter. Though one of the main ingredients in Belgian waffles is yeast, this ingredient can be substituted with self-rising flour. In this recipe, we are substituting baking powder for yeast. They are often eaten as a breakfast food. In North America, they are usually served with butter and maple syrup or with vanilla ice cream and fresh fruit (such as strawberries) as a dessert. A Belgian waffle Iron is needed in order to make these wonderful waffles. Check out the links below this recipe to see about purchasing a Belgian waffle maker. I have showcased the one I use in my kitchen. It is simple and easy to use, easy to clean and store and isn’t too expensive. 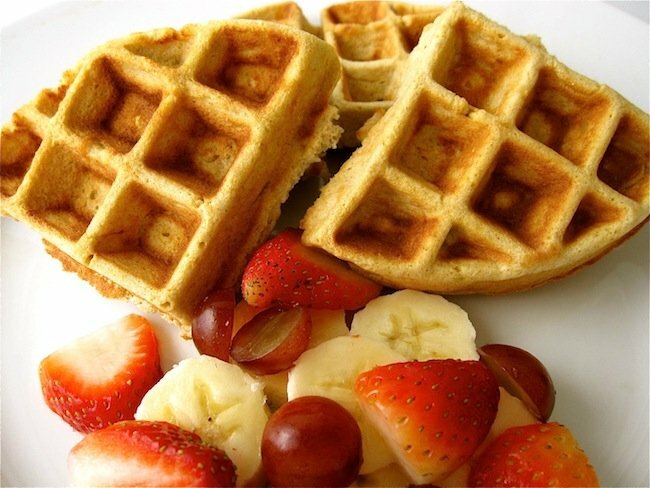 These organic Belgian waffles are gluten free & grain free. If you do not have a waffle iron, you could make these into pancakes by pouring the batter onto a skillet. Mix together eggs, maple syrup, salt, cinnamon, melted butter, milk, vanilla and 2 tbsp of water. Add coconut flour, baking powder and mix until there are no lumps. Let stand for 5 minutes. If the batter is thick, add up to 2 more tablespoon of water to thin it out. You should have the consistency of a pancake batter. Pour into a preheated waffle maker and cook for 2 minutes. Serve hot. Grab The Whole Lifestyle Nutrition Cookbook, Real Food Made Simple for more great recipes! Don’t have all the ingredients or equipment for this recipe? No problem! Click on links below to see about purchasing these products! Thank you! Thank you!! I’m gunna try ’em in the morning!!! @montanabby Your welcome 🙂 I think you really are going to like them! I had them for supper last night with a few slices of bacon and some organic pure maple syrup, Yum! Would a regular waffle iron work? Yes Rhonda a regular waffle iron would work just fine. GREAT NEWS!!! just got a new Iron!! Made them for myself for breakfast this morning–felt totally decadent! 😉 I used my regular old waffle iron (which I SERIOUSLY had to dust off!) and got 4 portions, because I didn’t want to overfill it… Lovely taste and really easy! I’m going to try heating the leftovers in the toaster tomorrow, too. Great Jan I am so glad you enjoyed them 🙂 I always make extra and then eat them throughout the week for a quick breakfast. They heat up great in the toaster oven. I literally just toast until lightly brown and they are perfect! I am making these right now! I am subbing in pumpkin for eggs and oil though. *not oil, just the eggs- a friend of mine subs it in like this and loves it! How much pumpkin to replace the eggs? This recipe sounds good, but after checking the ingredient list I wonder if they are correct. The recipe calls for only 1/4 coconut flour which in my opinion would make a very runny batter. Just wondering if this is correct. Coconut flour absorbs more liquid than most flours so you need more liquid in it. These were ok. I thought they held together well, unlike most gluten free things, but the flavor was a bit bland. not sure what it needs, but it sure worked in a pinch. I give it three stars. Arlene – Coconut flour soaks up moisture like CRAZY! Generally you can get by with quite a lot less coconut flour than you can any other flour, and sifting it in and stirring in small amounts is always a good idea as every brand is different and you may end up with a batter that’s TOO thick! I changed this recipe a little to make it easier and better for my diet. It turned out perfectly! 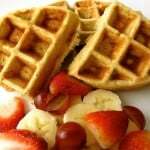 It was moist, delicious, non crumbly, and tasted better than other GF or regular flour Belgian waffle recipes. It’s now my go to recipe if I am craving a Belgian waffle. Thank you! this recipe did not work at all in my 100.00 waffle iron. i followed it to a T opened up my waffle maker and there was nothing left but caked on waffle stuff. Very disappointed and will not be passing this recipe along. You are welcome, happy you are enjoying it! Can I use honey if i’m out of maple syrup?